A versatile hunting dog originally bred to hunt everything from big game, such as deer, to small game like birds, raccoons and opossums, German shorthair pointers (GSP) are used primarily as a bird dog in the U.S. They remain one of the versatile breeds, however – those used to do it all; point, retrieve and track both furred and feathered game on land and water. Their hunting ability and affectionate nature make them popular as both bird dog and pet – for the last decade they’ve ranked in the top-25 of the AKC’s most-registered breeds. The athletic, streamlined body of the GSP contains energy galore and an incredible prey drive for birds – they are hunting machines that will tirelessly pursue game through the harshest of terrain. As affectionate, friendly and trainable as they are energetic, the GSP is also a great family dog and pet – provided you give it adequate exercise and mental stimulation. Their intelligence, which allows them to be trained easily, can become a detriment if ignored; like other hunting dogs, they enjoy working and need stimulation and a physical outlet or else they will engage in destructive behavior. They make suitable guard dogs and will bark at strangers or those approaching their territory. The origin of the GSP is an ambiguous one. Undoubtedly, as the name suggests, they came from Germany, and likely took their final form sometime in the 19th Century. According to the AKC, the GSP descends from the German bird dog, which was related to the old Spanish pointer that was found in Germany in the 17th Century. It likely has German hounds and tracking dogs in its lineage, which would have added keen scenting abilities and the desire to track game. The English pointer, among others, was likely added to give the GSP its athletic and pointer-like body characteristics. Handsome and well balanced, the GSP has a short, flat coat that is either solid liver or a combination of liver and white in color. 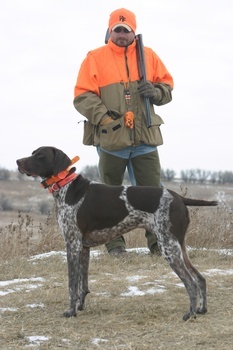 GSPs maintain a typical “pointer” look, but have a docked tail, and only come in the liver color, while pointers have an undocked tail and have several coat colors. As a medium-sized dog, GSPs enjoy a lifespan that averages 12 to 14 years. Their short coat requires minimal care – only an occasional brushing and bathing. While it does shed, the short, fine hair is nowhere near as bad as that of other breeds. GSPs suffer from hip dysplasia, so getting a puppy from parents that have had their hips checked prior to breeding is recommended. They also are prone to epilepsy, skin issues and eye problems. Like other deep-chested dogs, GSPs are a breed that is at risk for gastric torsion (or bloat). Paw Print Genetics offers screening for two known mutations in German shorthaired pointers. The first, cone degeneration, causes pups to develop day blindness and photophobia between 8 to 12 weeks after birth. The second mutation, Von Willebrand disease II, is the most common inherited bleeding disorder found in dogs. Affected dogs have increased bleeding due to either abnormal levels of, or function of, the von Willebrand factor, an important component in the blood clotting process. During the week of Nov. 18-24, if you order both tests and use the code “FBGSP” you will receive 10-percent off the cost of testing!